Personal truth: I live in jeans. Blame it on the fact that I grew up in L.A. or that my first job was doing PR for a denim brand, but I almost exclusively wear jeans. You could say that denim and I are in an extremely committed relationship at this point. Considering I wear jeans seven days a week, my denim assortment is pretty extensive at this point. I've definitely pared down my collection compared to my earlier days (I owned over 70 pairs at one point, don't judge), but I still own quite a few styles, if I'm being honest. In my opinion, different styles are required for different reasons; high-rise black jeans are so different from normal-rise black jeans. Kidding—kind of. I digress, but what I'm getting at is that given the amount of time I spend in denim, I start to notice when certain pairs garner more interest than others. There are six pairs of jeans that I can all but guarantee someone will ask me about every single time I wear them, which signals to me that there's something extra special about each pair. If someone takes the time to stop and offer the "Who makes your jeans?" or "Where did you get those?" questions, you know they're good. The below six pairs have garnered more inquiries than I can count, so I figured they're worth sharing. Keep scrolling to see the denim styles that always get me compliments and why. Plus, I've added shopping links to each in case they speak to you as well. The Natalia jeans from Grlfrnd are hands down the most flattering pair I own. The split hem gives the illusion of mile-long legs, and I have at least one person stop me to ask about them every single time I wear them. They're also 100% cotton with a button fly, so they have a unique vintage feel. This is the exact pair I own; 10/10 recommend. This is my first pair of Re/Done Originals, and it certainly won't be my last. I had previously worn a pair of Re/Done Levi's (which I still love! ), but the Originals collection is just as good. They feel perfectly worn in, and everyone asks if they're vintage, which is a huge win in my book. This is the pair I find myself reaching for over and over and over. 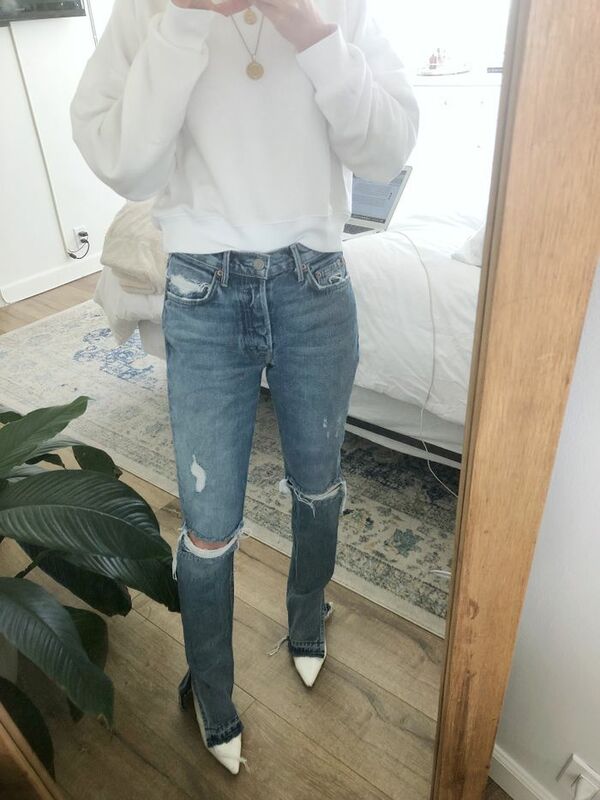 My Cotton Citizen Boyfriend jeans are easily one of the most comfortable pairs I own, and the baggy style always gets people talking. There's also a tiny bit of stretch in them, which even makes them wearable on a long flight. Bonus: You can wear these with or without the matching belt. When baggy denim started to trend again earlier this year, I was on the fence about how much wear I would really get out of a pair. Instead of spending a ton right out of the gate, I decided to test the trend waters with a pair from Zara. Little did I know I would be keeping them on heavy rotation without the need to invest in another pair—my Zara find was all I needed. The ultra-high rise makes them the perfect companion for crop tops, and I love the '90s vibe they give off. Sadly, the exact pair I got is now sold out, but this high-rise style feels like the winter version of mine. White jeans can be terrifying—I hear you—but let me tell you these are the least scary pair I've ever owned, and by least scary, I mean not scary whatsoever. The denim is thick and authentic with zero stretch, meaning nothing see-through here. Oh, and the cut is extremely comfortable to boot. Wearable white jeans do exist. I know, that's my least favorite phrase to hear when I ask someone about their jeans as well. We all know how difficult it is to find The One when it comes to vintage Levi's, and truthfully I had to get mine tailored to make them just right. But before you roll your eyes in frustration, let me introduce you to the below Ribcage Jeans from the brand. I recently discovered this style, which not only has a 12-inch rise but also has the exact straight-leg shape I get so many compliments on. If you want vintage Levi's vibes without the burden of the hunt, this is the pair for you. How cool are these pockets? These were basically made to be paired with a band tee. Meet your new everyday jeans. Same cut as mine, new color. These feel very '90s—in the best way. The split hem makes your legs look so long. Everyone will mistake these for vintage. These have a 12-inch rise—just saying. The ideal hem for boots. Another pair of non-scary white jeans. A weekend pair if I've ever seen one. The ankle hem is beyond flattering. Next up: the best new jean styles that launched this month.